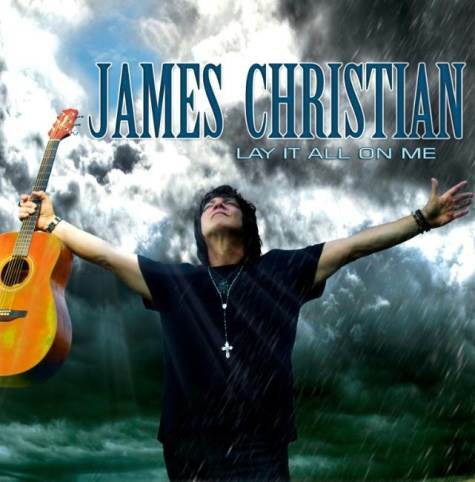 It has been 9 years since the release of a solo album by James Christian. No, he hasn't been absent from the melodic rock scene in all that time. He's been a bit busy with new studio and live recordings with HOUSE OF LORDS as well as working as a producer on a number of other projects. Lay It All On Me is, like most Frontiers releases, a collaborative effort in the songwriting department. Christian is surrounded by the writing talents of guitarists Tommy Denander and Jimi Bell, keyboardist Jeff Kent and others. This group effort does lead to some great moments on the CD but it also demonstrates that a solo album quite possibly should also be something where the artist in question is left to their own devices as well. Or at the very least, take the clearly defined lead in the process. Upon first listen, the first four tracks on the CD were problematic to say the least. The title track leads off the disc and despite the up tempo nature of the song, it is entirely flat. It just kind of lays there and while you keep expecting something to happen, five minutes pass, the song ends and nothing has occurred to really imprint the song in your memory. "Sacred Heart" and "Day In The Sun" were rockers as well and initially I was left cold by each song, but repeated plays found the songs growing on me as I dug deeper into each track. The former is the better of the two but both ended up being quite worth hearing. Bouncing between a mid tempo and more rocking style, "Believe In Me" teams up with the slower ballad-like "Let It Shine" as the weakest of the disc's material. Despite repeated plays of the disc, these were the numbers I felt like skipping over. After the first four songs, the album does start to pick up the pace. The second half of the album (minus "Let It Shine") is actually quite outstanding. While "You're So Bad" peters out towards the end of the song, it is the first song on the album that showcases Christian's rougher, grittier vocal sound. It starts out wonderfully and feels 100 times more lively than the four songs that precede it. That overproduced glossy sound you might be familiar with from the HOUSE OF LORDS CDs in particular shows up in "Sincerely Yours". The power ballad-slash-rocker amps up the production values to the nth degree and while it would grate on your ears if the whole album was like that, it actually makes the song work just that much more. The lead guitar work on the disc is supplied the trio of Jorge Salas, Jimi Bell and Shelby Stewart (James Christian plays acoustic guitar and bass). And the solos on three of the tracks of the tracks are things of beauty. In fact, those three tracks ("Don't Come Near Me", "Shot In The Dark" and "Welcome To The Future") are also 3/4 of my favorite cuts on Lay It All On Me. The edgier vocal performance on "Don't Come Near Me" helps it shine alongside the fretwork. The chorus for "Shot In The Dark" was excellent as well. The album closer "Welcome To Your Future" was fantastic with a smoking solo. But in all, I think the straight ahead fiery rocker "She's All The Rage" would be the track from the CD that I would pick to showcase as a means of introducing people to James Christian and his music. The vocals and music blend together in the just the perfect sonic mix. The melodic rock scene is thriving quite nicely and with so many listening options, you really have to work to have that special something that sets you apart from the rest of the pack. Lay It All On Me stumbled a bit out of the gate but recovered nicely and set about creating a pretty enjoyable album. James Christian may not be the most prolific solo artist out there but with Lay It All On Me, he proves that when he does have something to sing about, it would be a good idea to pay attention. You can purchase Lay It All On Me in the KNAC.COM More Store right HERE.